At the start of 2017 I was trying to cope with deep personal losses, including the sudden death of a family member. Simultaneously, my mother-in-law was going through a difficult time with her health. Hospitalized with pneumonia, transfused for anemia, suffering atrial fibrillation as a side effect of her CLL treatment and beginning new treatment which required her to be seen weekly for months. It has been my honor to be her health advocate and caregiver. And I chose to be with her during those long weeks of getting back on track. But all of these stresses together took a toll on me emotionally and physically. About the time I thought I was getting back on track emotionally, I was hit with some hurtful posts on Facebook that had to do with false accusations directed at my husband and our business. I took it hard and very personally; probably more than I would have if I hadn't already been so broken down by personal pain. I developed chronic health issues from stress. One day, as I sat in a doctor's waiting room struggling with anxiety, words began to come to me. They were coming so rapidly that I opened Notes on my phone and began to type them in so I wouldn't forget them. I was getting words to a song; blotting tears from my eyes as I typed. And when we were called back to an exam room, I had to interrupt the flow of words and emotion. The words had come without effort, and I started to wonder if I was just hearing words to a song someone else had written, thinking they were mine. So I searched online for any song I might be accidentally infringing upon. I found nothing. Later that evening, I sat down at my laptop and looked at the words I'd saved. More words quickly came. Fast forward to the start of this year. I asked God to give me a word for 2019. He had given me RELEASE for 2018 and I focused on releasing everything to Him the entire year. I thought I had a word for this year twice before the word HOPE started to show up repeatedly. I became convinced that was the word God had given me. But I wasn't sure about the context. I am by nature a hopeful, optimistic person whose coping mechanism is gratitude. But a long, hard trial over the last two years has tested my hopefulness, even though my trust in God has remained consistent. I try to remind myself of Tim Keller's definition of faith. I believe Keller says it is "Lord, what You will, when You will, how You will." It isn't about a specific outcome if it is genuine faith in His provision, His will and His timing. As I have grown both personally and spiritually through this trial, I have been able to (for the first time in my life) thank God for a difficult season before it is behind me. This in itself confirms to me that I'm in a growing season; not just a hurting season. As January approached, it became clearer and clearer to me that my word for this year was definitely HOPE. But I didn't feel like it was hope for an outcome. 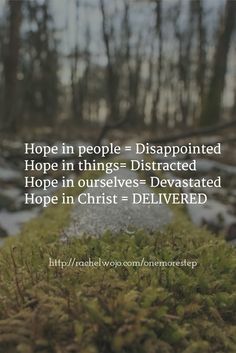 And since my struggle not to feel hopeless this past year has been about something specific, not an overall sense of hopelessness, I have wrestled with the word. Where I have landed recently is in a kind of hopeless acceptance of what is, even though I know that nothing is impossible for God. This morning I was asking God why He gave me that word and how He wanted me to incorporate it into my life more specifically. And I immediately felt impressed with the hope of Romans 8:28; that He is working all things for my good. I felt like I heard the words: "That is the hope I want you to continue in." I felt a confirmation that He was not telling me to have hope because this trial would end in 2019. Rather, to continue in the same hope that has carried me through every other challenge I have faced previously in my life. No matter how I feel, I must persevere in hope, not in hopeless acceptance. Then I came home from church and tuned into an online live stream of Christ Church in Nashville. And the choir began to sing "He is working all things for my good...even when I can't see it...I still believe it..."
At a crushing time in 2007, God told me, "I don't want you to put your faith and trust in a certain outcome. I want you to put your faith and trust in Me; that I am working all things for your good. Even this." It kind of feels like He is focusing me on that same message specifically for this year. I don't need to understand if that means I will be delivered from this trial or that this year is going to be even more challenging for me. But I know the promise is one I can trust either way.